The primary cause of excessive boredom in meetings is the utter lack of interactivity. For minutes or hours you are forced to sit in a confined space with nothing more to do but sit and listen. Simply finding a way to contribute to the discussion can help eliminate the monotony of the meeting and assist in allowing you to actually take something positive away from the experience. Though most meetings consist of one or more people addressing a group of employees in order to disseminate prepared information, listeners may find it beneficial to ask questions. Even if you aren’t allowed to interrupt the speaker(s), think up some questions, write them down, and save them until the end. If you are allowed to offer input during the meeting make sure to contribute as much as you can. This will help keep your mind busy and engaged in the flow of information instead of languishing in silence and disinterest. One of the major past-times of meeting dwellers is the doodling. While it may be considered inconsiderate and a breach professional etiquette by some, it can also do some psychological good (and how rude is it to subject you to hours of meaningless and inefficient talk, anyway?). But all kidding aside, doodling in a notebook can actually help you stay alert and focused. The simplicity of the doodle allows for an engaging activity while letting you continue to listen to the speaker without distraction. If all else fails you can always go to the source. Though it may come to nothing, you may want to consider approaching your boss and letting him or her know that your time is being ill spent in meetings when it could be used more efficiently elsewhere. 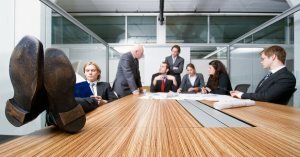 But while nobody really likes meetings (no really, they don’t) they are sometimes necessary. However, sometimes there is a better way to structure a meeting so that information is delivered more quickly and efficiently, the meeting takes up less time, and doesn’t drain employee morale for the rest of the day. For instance, meetings should always start on time, regardless of latecomers, and should stick to a length of 15 minutes or less. Keeping a strict time-frame forces the meeting leaders to get to the point quickly and deliver only the necessary information. Not only has this method been found to leave more time for work, employees are also more likely to retain the presented information since their minds remained engaged. Working with your boss to create better meeting structure can lead to the end of boring meetings and an all-around improved workday experience.